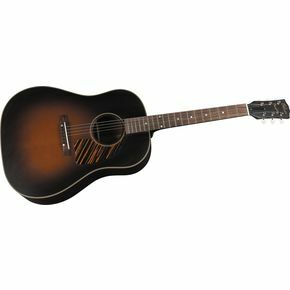 The Gibson 1942 J-45 Legend Acoustic Guitar is an exacting replication of the original 1942 Gibson J-45. Made with a solid Adirondack spruce top and solid mahogany back and sides, this beauty produces a mellow tone so full you can feel it reverberating in your skull. After locating an original 1942 J-45 in mint condition, Gibson rebuilt this new edition of its legendary guitar using the exact bracing patterns, wood thickness and even glue consistency to ensure that today’s J-45 is everything that you would expect a 1942 J-45 to be. Believed by many to be one of the best acoustic guitars ever made, the J-45 is a bit heavy when compared to modern standards, though it plays like a dream and its round-shouldered build makes it easy to handle for almost everyone. Aesthetically appealing, students of guitar history will also enjoy knowing that they are holding a little bit of history in their hands. At ~$6,800, the Gibson 1942 J-45 comes with a handmade “Red Stripe” hardshell, 1940’s style case and a signed certificate of authenticity; a fitting home for a guitar that is its own legend. Now you're just being silly. There exists NO guitar worth that kind of money. Period.